Posted on July 12, 2017 at 5:30 pm. Washington state’s 2017 legislative session was complicated by challenging political and fiscal dynamics. Governor Inslee called the Legislature back for three special sessions before members agreed on a state budget, which the Governor signed on June 30th, narrowly avoiding a government shutdown. Lawmakers were required to adopt a budget that would provide adequate funding for public schools per the state Supreme Court’s 2012 McCleary Decision. To satisfy those expenses, advocates and stakeholders worried that funding for social services would be severely reduced. Many of our supporters don’t often see what is required to protect existing policies and prevent changes that could put young people and families at risk. For the second year in a row, AWHWA faced major barriers related to differences of opinion about how to best meet the needs of youth (ages 12 through 17) and young adults (ages 18 through 24) who lack safe, stable housing. AWHWA initially led advocacy efforts to pass HB 1630, which would have improved the quality of data on minors experiencing homelessness by giving them the option to report personally identifying information to the Homeless Management Information System (HMIS). However, a key legislator added language in the Senate budget that would have denied youth services if they declined to share their information in HMIS. AWHWA responded quickly and was instrumental in playing defense, but as a consequence, the entire bill died. We also worked hard to protect specialized services for young adults, which were at risk of being combined with the system serving chronically homeless adults. Despite these challenges and others, the final budget and a slate of new laws took important steps in the right direction. The budget allocated $3.5 million to the state Office of Homeless Youth to support its programs. Funding will help prevent state systems of care from exiting youth and young adults to homelessness. Budget allocations will also help expand Crisis Residential Center and HOPE Center capacity to meet the immediate needs of youth experiencing homelessness. Governor Inslee signed HB 1867 into law, which calls for an evaluation of Extended Foster Care and allows young adults to reenter the program once between the ages of 18 and 21. AWHWA and many advocates hope this will help prevent homelessness for young people transitioning out of the foster care system. In addition, we are encouraged by the passage of HB 1661, which establishes a state Department of Children, Youth, and Families. This new agency will combine the efforts of the former Department of Early Learning, Children’s Administration, Juvenile Justice, and Juvenile Rehabilitation systems. We hope that the culture of innovation and emphasis on prevention fostered within the Department of Early Learning will be sustained in this new effort, supporting children, youth, and families to avoid crisis, housing instability, and homelessness. Posted on June 23, 2017 at 7:47 pm. A young woman living on the streets in Spokane shared with me recently that most young people experiencing homelessness are trying hard to find stability and safety in their lives. They are not choosing to be homeless, but rather are searching for resources. 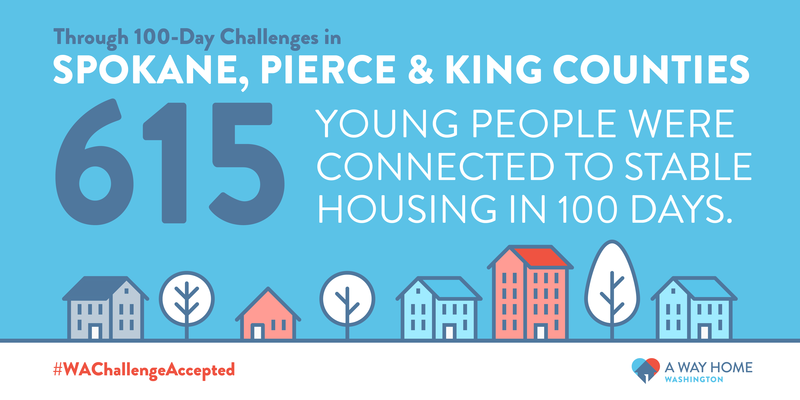 Over the course of 100 days, three regions in Washington state—including the Spokane area—are working hard and smart to address the barriers that prevent youth and young adults from finding housing. When Spokane, Pierce, and King counties kicked off the 100-Day Challenges in April, many people couldn’t have imagined the incredible progress their teams would be making across Washington state—from starting conversations and changing systems, to improving the lives of young people in each community. The King County, Pierce County, and Spokane teams are already changing lives and making a real difference. By helping young people experiencing homelessness find safe and stable housing, local leaders are sending a signal that communities CAN take ownership and turn the tide on youth and young adult homelessness. At the start of the 100-Day Challenges, on April 20, each team set a specific goal. These challenges were audacious, but attainable. We knew we weren’t going to solve homelessness in 100 days, but we pushed ourselves instead to ask what’s possible and examine how we could do things differently to expedite progress and support and empower our young people. As we pass the halfway point of the Challenges, we are excited to share initial region-specific and aggregate data from the three teams. Dashboards that provide a snapshot of each team’s goal and progress can be found here, on our 100-Day Challenges page. Currently, these dashboards include data up to Day 50 of the Challenges, and they will be updated periodically through early August. Each team is putting in the hard work to finish strong, and we anticipate even greater momentum over the remaining weeks. In fact, the Rapid Results Institute—the organization coaching our teams—has found that the first 50 days of other challenges are often spent laying the foundation necessary to accelerate progress over the final 50. I am thrilled about the advancement each team is making toward its numeric challenges. And I’m even more encouraged by the ways in which they are examining—and in some situations actually changing—system policies that remove barriers and get more young people housed more quickly. We also know that the 100-Day Challenges are about so much more than the work communities are accomplishing over the course of nearly four months. This is really about where we go on Day 101 and thereafter. That’s why we’re excited that conversations are happening about why young people become unstably housed in the first place, and how we can empower them to overcome those experiences. And everyone—at the provider, policy, and public level—is learning that it is possible to prevent and end youth homelessness in our state. I’m so proud of these three communities for saying “Yes” to their challenges. At A Way Home Washington, we envision a future in which a young person who says, “Yes, I want help finding a safe place to sleep,” or a family that says, “Yes, we want help to keep our teenager safe,” our communities will have the systems and services in place to respond with an enthusiastic “Yes!” and meet those needs. These 100-Day Challenges are an important step in that direction, and I hope you’ll continue to support our teams so that ALL youth and young adults in Washington state can find their way home. Posted on March 7, 2017 at 2:21 am. One of A Way Home Washington’s key strategies to prevent and end youth and young adult homelessness is to advocate for reforms and public funding at the state level. We see this as an important way to make sure that Washington state has the programs, services, and resources it needs to help all of our young people find their way home. In 2017, the Washington state legislative session is scheduled to run for 105 days, from January 9 through April 23. Legislators in Olympia face some tough challenges, including a mandate to fully fund basic education in our state. And as ever, political dynamics are bound to present challenges. However, A Way Home Washington believes that this is a unique point in time for our state to come together and make positive changes. The Office of Homeless Youth has presented its 2016 Report as a roadmap to creating a statewide system of care. Governor and First Lady Inslee have provided their support and leadership to this cause. And a growing group of partners have joined our movement. Together, we have developed a bold legislative agenda listing our priorities for 2017. This agenda reflects what we’ve been hearing and learning from communities across the state, and our work to develop tailored solutions that meet their unique needs and circumstances. We will continue to update this agenda throughout the course of the legislative session. Sign up to receive our newsletter, and share it widely with your network. Establish an interagency workgroup or Governor’s cabinet on youth homelessness. HB 1867: Evaluate Extended Foster Care. HB 1816: Improve admission practices for youth entering Crisis Residential Centers and HOPE Beds. Improve and expand family reconciliation and preservation services. Reform status offense laws to reduce the number of youth detained for actions like violating curfew and running away. SB 5241: Improve high school graduation rates by awarding students with partial or full credit for courses completed at a prior school. Support schools to fully implement the federal Every Student Succeeds Act and ensure accountability. Fully implement the Homeless Student Stability Program to connect older youth and unaccompanied youth experiencing homelessness to services and housing. Designate a trained staff person in every K-12 public school building that can identify and support students experiencing housing instability and homelessness. Appoint attorneys to all children and youth in foster care before their first shelter care hearing. Move funding for the Office of Homeless Youth to Commerce’s base budget. Support the Washington Youth and Families Fund. Generate new revenue for the state budget. HB 1630: Improve data quality by allowing minors experiencing homelessness to provide written consent to share their personally identifying information. HB 1661: Support the Blue Ribbon Commission’s recommendation to establish a new Department of Children, Youth and Families. Posted on January 26, 2017 at 11:08 pm. KOMO News Radio spoke with A Way Home Washington’s Executive Director, Jim Theofelis, following Governor Jay Inslee’s directive to create an interagency work group on youth homelessness and release of the Office of Homeless Youth’s 2016 report. Courtesy of KOMO News Radio. Interview aired on Tuesday, January 24, 2017.